Purpose/Objectives: Foxp3+ regulatory T cells (Tregs) play an important role in maintaining immune homeostasis. In malignant disease, however, Tregs contribute to the generation of an immunosuppressive microenvironment. To establish therapeutic approaches it is necessary to uncover activating and suppressive mechanisms. Immune checkpoint-blocking (ICB) monoclonal antibodies (mAbs) have been shown to elicit cancer regression and long-lasting tumor control. Particular interest was focused to the mutual influence of Treg cells and therapy by ICB. Materials/Methods: We used a c-MYC transgenic mouse model of spontaneously arising B-cell lymphoma, which mirrors key features of human Burkitt lymphoma. To assess treatment effects mice were intraperitoneally injected with mAbs against PD-1 and CTLA-4. Mice splenocytes and lymphocytes were analyzed by flow cytometry. Results: An augmented fraction of CD4+Foxp3+Tregs was detected in spleens and lymph nodes of tumor-bearing c-MYC mice. 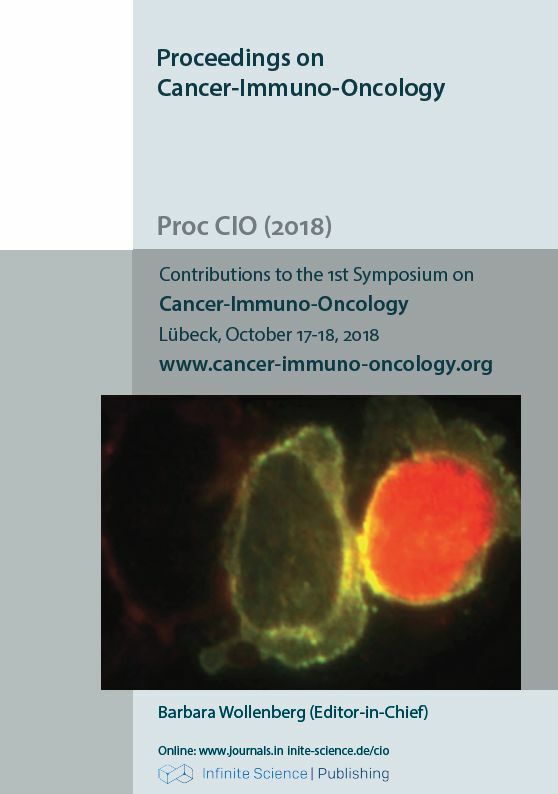 Tregs were involved in suppressing antitumor response because specific ablation of Tregs significantly delayed tumor development. Compared to wildtype mice, c-MYC Treg cells showed an activated phenotype as evidenced by upregulated CD69 and CD137. The high expression of the costimulatory molecule CD137 indicated TCR-specific activation. As intratumoral Tregs were predominantly Nrp-1+Helios+nTregs, we suggested that Tregs recognized tumor-associated self-antigens. We identified MHC class II-restricted self-epitopes, which were prevalent in lymphoma as compared to normal B cells and could be recognized by Treg cells resulting in enhanced proliferation (Ki-67) in vitro. Interestingly, effector T cells (Teffs) were able to recognize the same epitopes. Antigen contact apparently led to upregulation of IL-10. In vitro suppression assays showed that Tregs from c-MYC and wt mice potently suppress proliferation of Teffs in a dose-dependent manner. When preventing cell contacts, Teff proliferation was increased and almost restored upon additional IL-10 neutralization. Tregs from c-MYC mice treated with anti-CTLA-4/anti-PD-1 mAbs revealed a lower suppressive capacity. Conclusion: In malignant lymphoma, nTregs directed against self epitopes are involved in cancer immune escape. Taken together, the Treg population is a promising target in future immunotherapies and needs to be further investigated.